Looking for a rich Cobalt, Indigo, Navy, Ocean, Ibiza Blue or a even a vibrant Peacock Blue. Going through a Blue Phase. Our new Paxos lamp is inspired by the deep Ioanian Sea and is a real blue beauty, with a modern retro feel and the look of the moment. 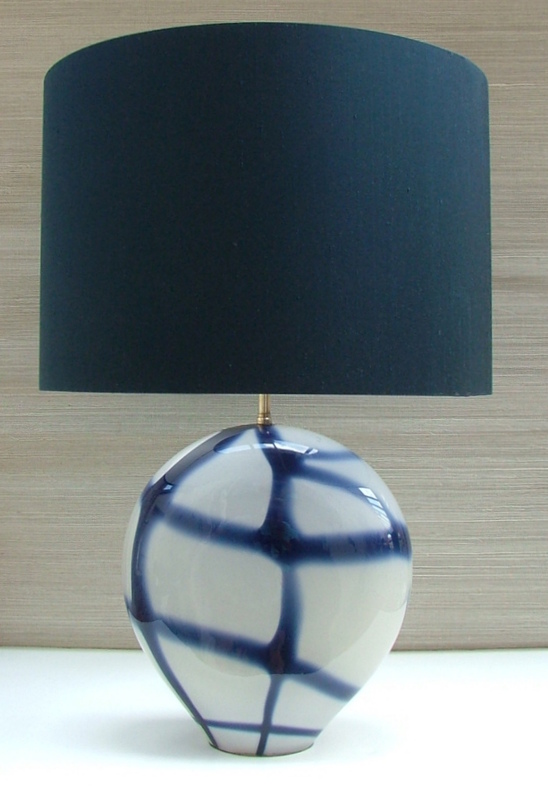 This breezy, bright hand blown glass table lamp in blue and white suits a striking modern palette, it has real personality and a lovely lustre. Shown here in Indigo Blue, it can be finished in other hues of blue to suit your scheme, a Lipstick Pink, a Lettuce Green or any another colour of your choice. All our products are handmade by craftsmen in Britain. The Paxos lamp is slim, ideal for a console or narrow table, pictured here from the side view. 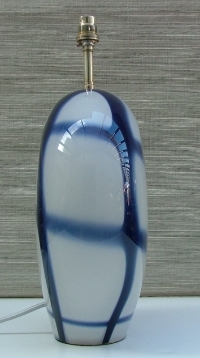 Width of lamp at widest point 29cm. Depth of lamp 13cm, front to back. The straight sided oval lampshade, 28cm high, 50cm wide, 30cm deep. 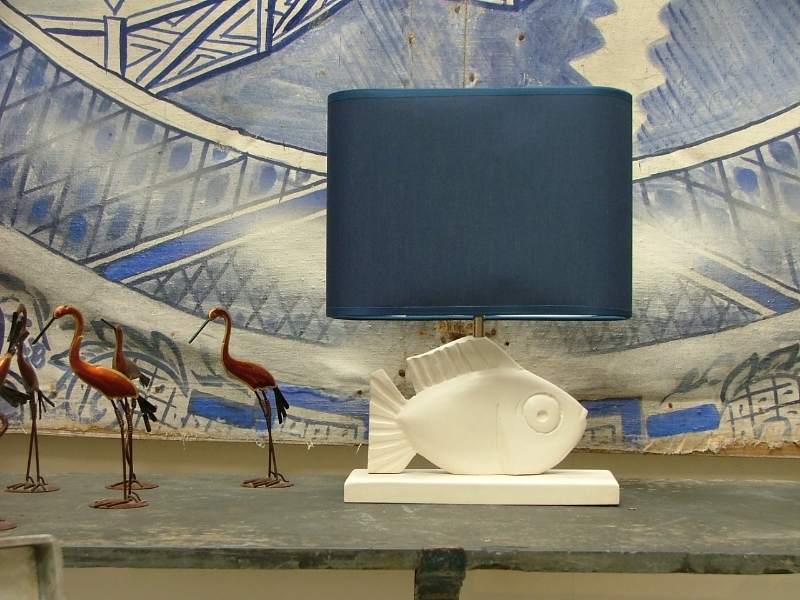 If you are looking for a nautical theme, a summery look, some statement lighting, sculptural beauty and a bit of fun, here is your catch, the St Pierre table lamp. Finished here in Rock Salt white with Midnight Blue shade. 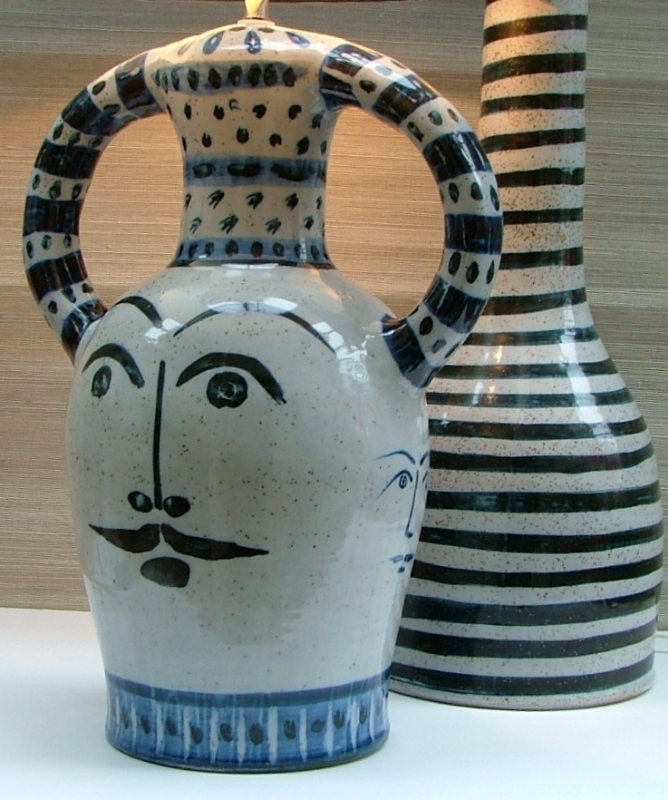 Blue and white is proving an interiors trend, if you missed our newsletter about the new blue and white contemporary ceramics, hand painted creative, playful images reminiscent of those currently very fashionable Mediterranean artists that were working in the 1960’s and 1950’s on the French Riviera, then Click here for more information.